Mitsubishi has developed another vehicle for electric vehicle research, the Mitsubishi i MIEV. Mitsubishi took the Mitsubishi i, and installed a lightweight motor into it, hooked up to a pack of high-energy density li-ion batteries, retaining the rear-midship layout. The Mitsubishi i’s rear-midship engine location allows the new motor and battery packs to be placed in front of the rear axle line, which ensures ample cabin space for passengers. The Mitsubishi i MIEV is also equipped with an on-board charger which supports charging from ordinary electric outlets – plug-in capability! Mitsubishi will begin joint research with the Tokyo Electric Power Company, and The Chugoku Electric Power Co., Inc., in November 2006 and with Kyushu Electric Power Co., Ltd, in January 2007. 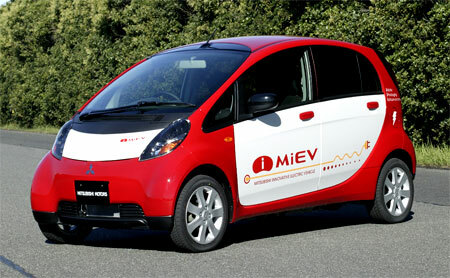 MMC will provide each power company with Mitsubishi i MiEV cars. The power companies will evaluate how fast-charge infrastructure can be developed for electric vehicles. Fast charging will allow the Mitsubishi i MIEV to be charged in about 20 minutes, compared to the hours it takes now. 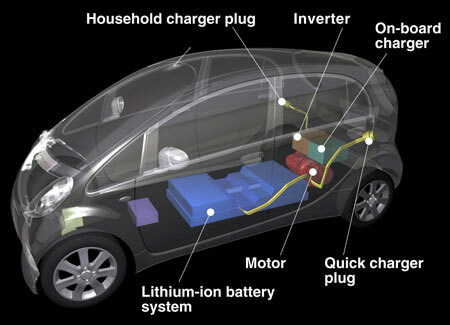 After this first phase, fleet testing will begin in Autumn 2007 in order to verify the vehicle’s technical capabilities in daily use and to evaluate the commercial acceptance in collaboration with the power companies above along with, the Kansai Electric Power Co., Ltd, and Hokuriku Electric Power Company. The data collected from the test of daily use shall be used to assess the commercial viability of EVs in the market place. The 1080kg electric vehicle is powered by a permanent magnet synchronous motor developing 63 horsepower and 180Nm of torque. This motor spins up to 8,500rpm, which translates to a top speed of 130km/h. This is hooked up to a pack of 330 volt lithium ion batteries which will have a 16 kWh capacity at first, but is expected to be 20 kWh during the fleet test phase. With a 100V power supply, it charges in 11 hours to 80%, and with a 200V supply it fills up to 80% capacity in 4 hours. And did I mention it’s rear wheel drive? I just did :) Check out Mitsubishi’s other electric vehicle, the Mitsubishi Lancer Evolution MIEV. One more diagram after the jump.